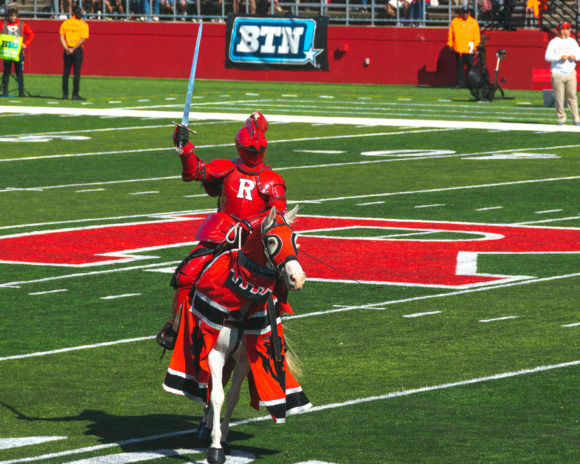 Share the post "Charging the Field: ESC Awards Spirit of the Horse to Kennis Fairfax, the Original Scarlet Knight"
The Scarlet Knight has had a few different iterations since joining the Rutgers Football Team. Kennis “Buttons” Fairfax is one of the Knights in rotation during football games, and even if he isn’t riding the horse during the game, Fairfax can be found as part of the team that gets the horse ready, only having missed one game in the last 25 years. 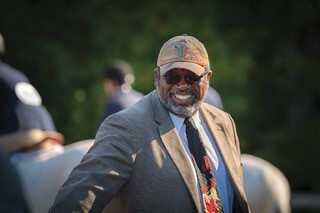 The Equine Science Center honors Kennis “Buttons” Fairfax, the cowboy, artist, teacher, judge, coach, mentor, and Scarlet Knight, with the 2019 “Spirit of the Horse” award. This story is excerpted from Equine Science Quarterly, Winter 2019. From a young age Kennis “Buttons” Fairfax developed a strong connection to his family, and what it really meant to be a contributing member. Growing up, it was Fairfax’s grandmother with who he had a strong connection. She was instrumental in helping his mother raise him and his sisters, and when his father passed it was his grandmother with whom he ended up living. When she moved to New Jersey to live with Fairfax’s uncle, it was only natural that he followed. Each summer though, he would travel from New Jersey with his grandmother to help relatives in Georgia and Oklahoma. 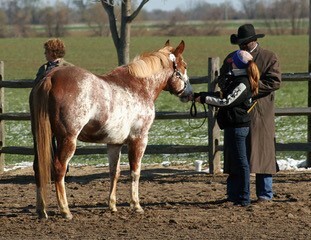 It was also during these trips that Fairfax developed a deep love for horses (as well as other four-legged friends). His family owned plots of land in both Georgia and Oklahoma, and his job during these summer trips included caring for the horses and mules that were used for farming on the family’s many acres. During the school year, back in New Jersey, Fairfax also developed a passion for the arts, as well as sports, which ultimately lead him to a successful career as a teacher, mentor and coach at Arts High School in Newark, the nation’s first public high school for the arts. While Fairfax’s pursuits in his own education and career incorporated a balance of his interests of sports and the arts, his love for horses remained a part of his life, and he eventually became known internationally as a clinician and judge in the Western horse world. Fairfax jokes that he hates people but loves horses, so trying to bridge the gaps between people communicating with their horses is something that he enjoys, both for the betterment of the person and the horse. One such connection was formed through an interesting idea about the Rutgers Football Team around 25 years ago. Fairfax had been invited to Rutgers to judge the Horse Show at “Ag Field Day” (now a part of the University wide “Rutgers Day”) and was approached by a man who thought that the Rutgers Football Team needed a little something to stand out during the games. This man, Jorge Hernandez, would work with Fairfax to create the image of the Scarlet Knight at football games; one of a battle-ready knight riding into the stadium on horseback to conquer. While Hernandez took the lead, it was the “Alum-Nuts” as they call themselves; a group of Rutgers alumni, Cook College alumni, Livingston alumni, and even a few Rutgers staff members; that came together to make this happen. Hernandez also wanted to be sure that this was done safely, and that an experienced rider would be donning the Knight’s armor. After some convincing, it was decided that Fairfax would be the perfect candidate to take the field. 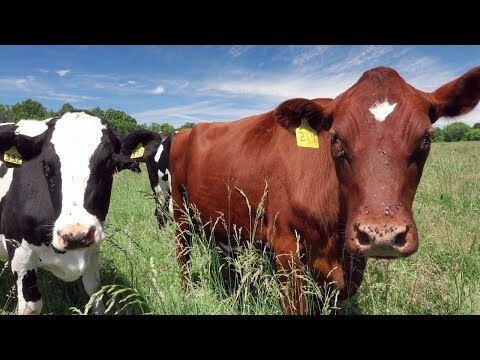 For the next 25 years, this image became the embodiment of a Rutgers Football Game. During his time as the Knight, Fairfax, with the help of Hernandez, has used a few different horses, but none are as memorable as Rutgers Equine Science Center’s very own Lord Nelson. 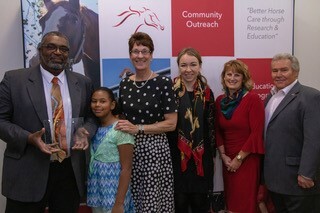 L-R: Fairfax with his daughter Tatiana, and Rutgers Equine Science Center staff and board members Karyn Malinowski, Amy Butewicz, Carey Williams, and Warren Zimmerman, after receiving the 2019 “Spirit of the Horse” award. Recently, Fairfax was invited back to Rutgers University to receive the 2019 “Spirit of the Horse” award from the Equine Science Center. This award is given to those who have made a positive impact on the equine community, helped others to get involved, and whose lives have been changed because of the profound connection between horses and humans. Awarded at the Center’s “Evening of Science & Celebration” in November 2018, Fairfax was presented this honor by former Governor Richard J. Codey. Read the full story in Equine Science Quarterly, Winter 2019.